In his memoirs, the Austro-Hungarian scholar and Albania expert, Baron Franz Nopcsa (1877-1933) [see Document 1913 Nopcsa], tells us how he was taken hostage by the notorious bandit Mustafa Lita in the mountains of Dibra in 1907, and how he got away from him. 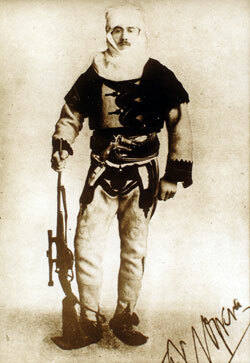 Baron Nopcsa in northern Albanian dress. 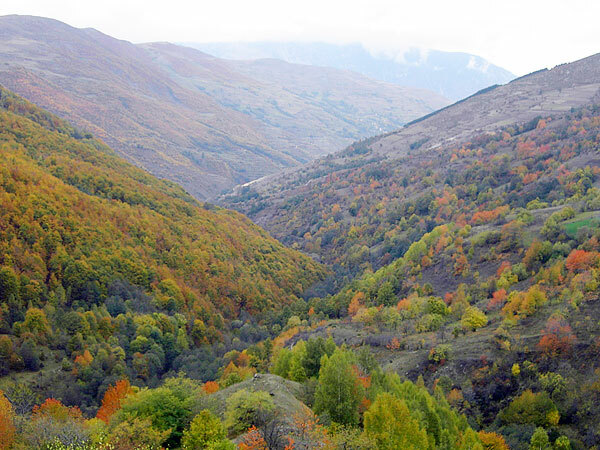 In November 1907, I wanted to travel from Shkodra to Mt Korab via Kalis and from there, to hike to Shtirovica. To this end, I turned to the Abbot of Mirdita for his advice. I knew that the abbot was well informed about Kalis and the surrounding area. He recommended that I go and see a certain Mustafa Lita in Kalis, who, he said, was a friend of his. I thus set off. Between Fan and Arrën, I put on Mirdita dress. I gained some insight into the customs of the robbers of Mirdita when we stopped on Mount Zeba for a rest and for lunch. Two Catholics came by with eight sheep. When the first of them saw us, he was terrified and pointed his rifle at us. The sheep he had with him were shorn and bore a rectangular marking on their backs. This proved to me that they had been stolen from Reka where they use this sign as identification. After this, we continued on our way. Mark, one of my companions, was a follower of Mustafa Lita at the time. Like many or all of the men of Fan, he had pilfered a lot in Dukagjin and Reka, and provided me with a good deal of information on our way to Kalis. The countryside between Arrën-Reç and Mount Korab, and the territory of Puka is called Dukagjin and the people who live there call themselves Dukagjinis, and are called that by their neighbours. On Mount Zeba, between Arrën-Reç and Guri i Nusjes, there were large groves of beech trees. There was no visible lookout on Mount Zeba and as such, my companions and I managed to get to Ujmisht in the rain without being noticed. While we were descending towards the Drin River, we passed the hut of a fellow who asked my men from Fan if they had friends in the area. Bajazid said yes. Later, this man observed us approaching his kulla [stone tower] and rushed towards us to protect it because he was afraid that we were robbers. We did not notice him at the time and took a shortcut across some fields. When the fellow caught up with us we were no longer near his kulla. There was a heated exchange until our opponent recognised my man, Nikoll Xhuxhaj, as his kumbara [godfather]. He then accompanied us to Ujmisht to the house of a certain Mahmud, who was another kumbara of Nikoll Xhuxhaj, where we decided to spend the night. The head of the family was absent, so the others summoned him. The sole topic of conversation all evening were the raids that the men of Fan and Dukagjin were conducting in the Reka region and their fights with the nizam [Turkish solider] posts. I learned from the conversation that the armed bands attacking Reka consisted of up to 200 men and that the raids usually resulted in dead and wounded. The booty, which often consisted of hundreds of sheep and fifty to sixty horses, was usually taken to Gjakova over secret trails where it was sold off. The leader of such armed bands is called a kallauz. Apart from indulging in thievery, the men of Ujmisht go abroad to find work as boza [millet drink] and halva [oriental sweets] sellers. The costumes worn by the men of Ujmisht include white çakshir trousers, wide at the top and narrow at the bottom, and stockings that reach up to the calves, often with a red pattern. The trouser legs are held together at the bottom by the laces of the opankas [sandals]. On their upper bodies they wear an anteri [long-sleeved jacket] and a thin xhurdi [black woollen jacket] with no fringes on the back. It goes down to the hips. All of them wear the perçe [tuft of hair at the back of an otherwise shaven head]. We slept well in Ujmisht. The houses are of the kulla type, all at some distance from one another. In Vila we found kullas that were built closer together, and houses made of rubble with no whitewashing. In Ujmisht I learned something of their habit of going abroad for work. On the way to Vila we met some men who were on their way to pick up a bride. They recognised me as a foreigner, but Mahmud stated that I was his mik [guest] and that quelled suspicions. The wedding procession soon went its own way and we observed it from the distance as it stopped in front of the home of the bride. After numerous volleys of gunfire, the men of the procession entered the house, had something to eat and took the bride with them. This is different from the custom in Reç where no one enters the bride’s home. Mahmud accompanied us to Vila. Travelling in an Albanian costume is much better than in European dress. Firstly, the people don’t stare so much and secondly it is much easier to make contact with the locals. Mahmud turned back just before we reached Vila because he was party to a blood feud there. There was a beautiful mosque in Vila and yet all of the inhabitants were robbers. However they did not rob in their own village. Order must reign at home. Mark was sent in advance from Vila to Kalis to inform Mustafa Lita that we were on our way and returned from Kalis that evening. When we got to Kalis, I was drenched because of the pouring rain, as I had been the previous day. My clothes soon dried beside the open fire. Mustafa Lita was a portly fellow, but agile and quick in his movements. He seemed quite muscular. He had a large grey moustache, always entered the room with large forceful strides and hastened to take his seat, during which time all the rest of the men rose to their feet. He was promptly served by his men. One of them took his socks off and another brought water for him to wash his feet. Another man handed him his metre-long pipe and cigarettes and someone else gave him a light. Mustafa Lita was taciturn and looked quite confident without having to say anything. He had large steel-coloured eyes that revealed little of his thoughts. The only indication of what he might have been thinking came from his intonation and gestures. He was not a calm person, but was not overly agitated, simply decisive. There was something rather peremptory in his conversation. The reason I am endeavouring to describe Mustafa Lita in such detail is that he was one of the most dastardly robbers of Dibra in all of Turkey at the time. He reminded me of descriptions I had read of Ali Pasha Tepelena, the ruler of Janina. I told Mustafa Lita that I had come to help him fulfil a wish of his, without referring precisely to what I meant. Mustafa Lita then revealed that he had asked the abbot to get him the position of a bimbashlik [army major], but that Husein Hilmi Pasha, the inspector general of Macedonia had prevent it. We then conversed of matters of little importance. Soon thereafter, we washed our hands for dinner and a table was brought in for the food. Mustafa Lita sat down at the table alone and broke the bread, distributing the pieces. Everyone else in the room waited at his place for Mustafa Lita to call them to the table. Mustafa Lita ate quickly and the evening was well spent. The weather was not particularly good the next day and Osman, Mustafa Lita’s son, told us that the trail to Shtirovica was snowed in. He suggested that we should stay in the upstairs room of the kulla, the carpeted room in which Shemshi Pasha had spent the night, so that the many guests downstairs would not see us. Osman also told us that three men from Tropojan had once been held prisoner there and had been locked in the attic overnight. He admired my Mannlicher carbine, but even more so, my chequebook and my field glass. Then he left the room. While we were in Shemshi’s room, two sparrows flew in. We caught them and gave them to Mustafa Lita’s young son, joking all the while that we had ourselves flown into Mustafa Lita’s kulla and were caught. That evening, Mustafa Lita came up to our room for dinner. Osman and Dalip visited us the next day, but the weather continued to be bad. On the third day, it was nice out in the morning and so we told Osman that we really had to get to Shtirovica that day. We asked for men to accompany us on our way. Osman disappeared and it was only in the afternoon that he returned. Now, he said, it was too late for us to depart. We replied that it did not matter if we got to Shtirovica after dark. Osman said he would go and talk to Mustafa Lita, and then returned with the reply that Mustafa Lita could find no men for us that day. Osman promised that he would accompany us to Shtirovica personally with a whole group of men. Neither Bajazid nor I appreciated all the excuses and we began to suspect that something was amiss. In the afternoon, Mustafa Lita called for Bajazid and informed him that we were his prisoners. He was demanding ten thousand Turkish pounds for our release, and a further ten thousand if his kulla were in any way damaged as a result of our capture. He also tried to get Bajazid on his side by promising him two thousand pounds. Bajazid resisted and, though horrified, skilfully proposed that Mustafa Lita not demand money, but rather agree to turn me over in Prizren as a spy, as I was in native disguise. Mustafa Lita suspected a plot and refused. Bajazid returned to the room and informed me about what was going on. My initial impulse was to shoot Mustafa Lita and put an end to the nonsense, but they I thought better. Mustafa Lita then came up to our room and I greeted him calmly. He repeated what he had said to Bajazid and added that he was not doing this to harm me but simply to infuriate the sultan who had refused to make him a bimbash. If his kulla were to be burnt down by Turkish troops as a result of this event, he would be forced to demand twenty thousand pounds. I replied that it was immaterial whether he wanted ten or twenty thousand pounds because it would be the sultan, not I, who would have to pay up. I added that it would be a shame if his kulla were to be burnt down because being chased by soldiers in the middle of winter and having to spend the winter in some miserable hut would be unpleasant. I promised that I would endeavour to prevent him from being pursued. Mustafa Lita agreed. I informed Mustafa Lita that he had caught such a big fish that he would not be able to get it out of the water. After we had discussed the matter thoroughly, I suggested that we talk about something else, but Mustafa Lita would not desist. I asked him for five days time to consider whom I should best inform about my capture. Among the alternatives were Abbot Doçi, the consulate in Shkodra, the consulate in Prizren, Husein Hilmi Pasha, my father and the Austro-Hungarian embassy in Constantinople. I told Mustafa Lita that I was considering writing to Hilmi. He replied that this would certainly result in the secondment of soldiers. I noticed from the expression on his face that he was not too enthusiastic about this. I therefore insisted and he gave me the time to think things over, saying “sa duket” and departed. Not long after his departure, a certain Doda arrived, whose brother was training for the priesthood in Rome. I had him make the sign of the cross. He asked me to say the Lord’s Prayer for him and inquired about the various parts of mass in order to see if I were really Catholic. I replied to his questions and told him how I had been betrayed by Mustafa Lita. I then gave him a letter for the Abbot of Mirdita that he was to send off right away. In the letter, I requested that the Abbot send 500 armed men or opium and twenty men. Doda departed and Osman then came into the room. I greeted him but did not say anything of significance. I asked him in passing who had planned our capture. He said he had devised the scheme himself. I replied that he had studied his father’s ways well, adding with a laugh that he was being pa besë [treacherous] to his guests” He blushed in shame. At Osman’s request, we went outside for target shooting. I was a better shot than Osman, who soon skulked away. Dalip then came to see us. He was outraged at Mustafa Lita’s behaviour towards his guests and muttered that nothing like this had ever happened in Kalis. He added that he wanted to help us. I realised that Dalip was out for personal profit and discussed the situation with him seriously. He asked me how the matter would end. I told him that Mustafa Lita would get no money, his kulla would be burnt down and in a final shoot-out he, i.e. Mustafa Lita, Osman, Mustafa Lita’s second son Ali, Bajazid and I would all die. “The men of all the highlands of Shkodra, all of Mirdita, Mat and Lura will arrive. Troops will be sent from Dibra, Gostivar and Prizren, and Mustafa Lita will be crushed.” Dalip noted that not even all of Kalis was for Mustafa Lita because people were upset at his behaviour. The question thus arose as to what was to be done. After much discussion, Dalip and I came up with three possible outcomes. One was that Mustafa Lita would demand his 10,000 pounds; my Albanian friends and Turkish troops would arrive; Lita’s family lineage would be dishonoured; and everyone would be massacred. The second possibility was that Mustafa Lita would demand a bimbashlik position for my release. In this case, I would try to calm down my friends and would endeavour to keep Turkish troops out of Kalis and negotiate with the authorities. The end result in this event was unclear. The third variant was that Mustafa Lita would take me to Prizren and turn me in as a spy. He would thus be amnestied by the government and I would support his request for a bimbashlik. Dalip promised to transmit this proposal to Mustafa Lita. Bajazid and I hid a razor under the carpet in case Dalip’s scheme failed and Mustafa Lita continued to hold us prisoner, planning, in case a guard should be sent to sleep with us and try to take our weapons and knife away from us, to kill the guard and climb out of Mustafa Lita’s tower with sheets and carpets tied together. Dalip slept in our room and spoke to Mustafa Lita in the morning. He also intimated that he hoped to get a bakshish [a tip] out of the deal. Bajazid was very depressed the whole time. I tried to give him courage. Following Dalip’s talk with Mustafa Lita, Mustafa Lita, Ali, Osman and Dalip all came up to our room. Mustafa Lita declared that the whole detention had simply been a trick to test our resilience and that we were free to carry on to Shtirovica. I sensed a trap and reiterated the proposal I had made the first day that I would assist Mustafa Lita in getting his bimbashlik. Now that everyone knew about our imprisonment, this was the best solution because he could hand me over to the Turkish authorities in Prizren as an Austro-Hungarian spy. The proposition was accepted and Bajazid was to be sent into Prizren. I was to be handed over to the Turkish authorities there, armed with my Mannlicher carbine. The Mannlicher carbine was an important element for we had agreed that Mustafa Lita would say that he had recognised my importance as a public figure by the quality of my weapon. In actual fact, I wanted to make sure that Osman did not keep the weapon as a ‘souvenir’. Osman had been careless in expressing his interest in the rifle. I promised that I would help Mustafa Lita get his bimbashlik. After Mustafa Lita’s departure, Osman informed us that Dalip had done the trick and helped us. I replied that he was stupid because he would now not get the Mannlicher carbine as it was to be confiscated by the hükümet [Turkish government]. Just before we left Kalis, Mustafa Lita asked me to inform the abbot that nothing had happened to us in Kalis. I thus expedited a second, open letter to the abbot via Doda, after the first, secret one, and we were all invited down to lunch by Mustafa Lita. Throughout our stay in Kalis we were not visited at all by Mustafa Lita’s son Ali or by a certain Rrahman because they were too ashamed at Mustafa Lita’s betrayal of his guests. 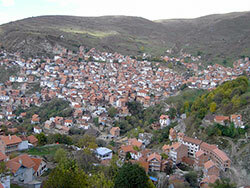 Kalis has isolated houses in central Albanian style and little hamlets consisting of groups of houses built together. Blood feuds among the various families are laid to rest quickly. It is rare here for people to hold up in hiding like they do in Lura. The men of Dukagjin steal in Reka. The men of Reka steal in Skopje and Macedonia, and even in the region of Adrianople and Anatolia. On the fifth day of my stay in Kalis we set off for Prizren: me, Bajazid and Mustafa Lita with two horses. Mustafa Lita rode on one horse. The other one was for Bajazid and me. The horses took us to the plateau near Qafa e Restelicës where deep snow prevented them from going any further. We had a frugal meal of cheese and bread consisting of cornmeal, flour and suet. In the afternoon, we continued on towards Restelica. Because of the fog and snow, we almost lost our way, but managed finally to get to Kepi and, from there, to Restelica. Mustafa Lita, Abdul Rrahmani, Dalip, Bajazid and I slept in the house of Molla Sadiku. They rest of them in another house. The room was carpeted and comfortable. There was even an iron-cast oven, but the windows were tiny and let little light in. We had been drinking coffee at a coffeehouse when Molla Sadiku invited us to his place. Many visitors came around to the house of Molla Sadiku, including a hadji who spoke Romanian and other clerics. I conversed a bit with the hadji, but spent most of the time with Dalip planning the rest of the journey. The people there seemed quite educated. Most of them could read and write. Restelica is situated at the edge of a plateau above a deep valley. It is a large village with lots of shops and coffeehouses. The streets look quite civilised. The stone houses look well built, although there is no whitewashing. Restelica has over 300-400 houses and more than 100 horses. Its inhabitants are by no means poor. A lot of Slavic is spoken here. The people did not ask many questions about me. Only the hadji was curious. Bajazid whispered to me in Hungarian “ne mondjon semmit” [don’t say anything]. I later discussed the coming day with Mustafa Lita. I suggested that we arrive in Prizren in aksham [the evening] so that my arrest would not draw too much attention. I would spend the night in an individual cell of the prison there. The next day was market day. We thus suspected that the hükümet office would be closed. Aside from this, we agreed that I would not be taken into custody with my Mannlicher carbine but with Bajazid’s Martini rifle. This would avoid my Mannlicher being confiscated. We left Restelica the next morning according to plan and marched all the way to Prizren without a stop. I had spent most of the last few days on foot and Bajazid was exhausted despite the horse. Our lunch consisted of cheese and bread. On the evening of our arrival in Restelica we had eaten beans, meat and other Turkish food. It was all good enough, but I had terrible heartburn afterwards. When we were on the road passing through the settlement of Zli Potok, I wanted to have an apple. Bajazid was very upset at this and told me that it showed a lack of manners and was rude to eat while on the road in eastern Albania. I recognised the road from Karaula Guri Dervent onwards. We reached Prizren an hour and a half before aksham. Just before we got into town, my rifle and cartridge belt were taken away from me and a rope was put around my waist. The rope was held by a Kalis man to show that I was their prisoner. Mustafa Lita was terrified that I would betray him in Prizren. When no one was watching, I gave Bajazid a note for the consulate. Mustafa Lita took my baggage and returned it the next morning to the hükümet. Bajazid was not allowed to go to the hükümet because Mustafa Lita was afraid of being tricked. My entry into Prizren in Mirdita dressed caused great attention in the streets. At the hükümet, too, though not overly. Mustafa Lita told the police bimbash that he had come across me on the trail from Vila to Kalis, recognised that I had disguised myself as a local, and had lured me to his home. I had tried to escape, but he had caught me and was now delivering me up to the authorities. I was shown to the bimbash, whom I knew from earlier, but who did not recognised me. I was then sent to the mutasarrif [governor]. To impress Mustafa Lita, I sat down à la franca, crossing my legs, and spoke to the mutasarrif in French. I confirmed what Mustafa Lita had told him and asked the mutassarif to inform the consulate. The musasarrif seemed embarrassed and stared at my passport until I said: “Ne regardez pas toujours ce passeport, les lettres restent toujours les mêmes.” I then repeated my request, but in a more demanding tone of voice. I was taken back to the bimbash and then handed over to the prison commander, a certain Mylazim, where I was to spend the night. Bajazid had informed the consulate which now intervened on my behalf. The mutasarrif and the consulate telegraphed to Salonika. Vice-Consul Prochaska sent me food and blankets for the night in prison. After dinner, a telegram arrived from Hilmi Pasha and later another one from the vali of Skopje and I was accompanied to the consulate in full honours. I spent the evening there. Prochaska was highly amused by the episode. He is a kind man, but no genius. I spent several days in Prizren. In his telegram, Hilmi Pasha had barred me from any further travel in Turkey. When Mustafa Lita took my baggage to the hükümet and they did not even inspect it, he was disappointed, having hoped to make a bundle on my aneroid barometer, etc. The police commissioner brought everything, including the confiscated Martini to the consulate. As such, everything went well in Prizren. However, in Shtirovica, Bajazid’s father had heard of the whole incident with Mustafa Lita and turned up in Prizren with ten armed retainers. He had left a further forty men in Restelica. His original intention had been to ambush Mustafa Lita near Kepi, but he got there too late, and now he wanted to shoot Mustafa Lita in Prizren. Bajazid and I prevented him from doing so. We told Doda and Bajazid’s father about everything that had taken place in Kalis. The truth was known in Prizren and Mitrovica and, as such, Mustafa Lita hastened back to Kalis a few days later. Of course, I was unable to help him any further.